I’m super excited about fall flavors. The pumpkin, cinnamon, apples, spices- they are everywhere and I love them all. The temptations to dive into sugary, gluten filled treats is everywhere. So, to tame my cravings for everything pumpkin flavored, I made this Paleo Pumpkin Spice Coffee creamer. It uses hazelnut milk as a base, but you can really use any acceptable nut milk. I made my own & the process is super easy. Here’s a link if you want to try it out. Also, until recently I never used a real vanilla bean for anything. This tutorial from Chow helped me to figure out how to scrape a vanilla bean. This is the method I used to make the coffee creamer. Blend all the ingredients in a blender until well combined. Store in the fridge for 2-3 days. Mix well before adding to coffee. Although I say that this is a coffee creamer, this recipe is adaptable into other goodies. Some suggestions are to make a Pumpkin Spice smoothie. Blend a banana and a few ice cubes in a blender with the creamer as the base then sprinkle it with some cinnamon. 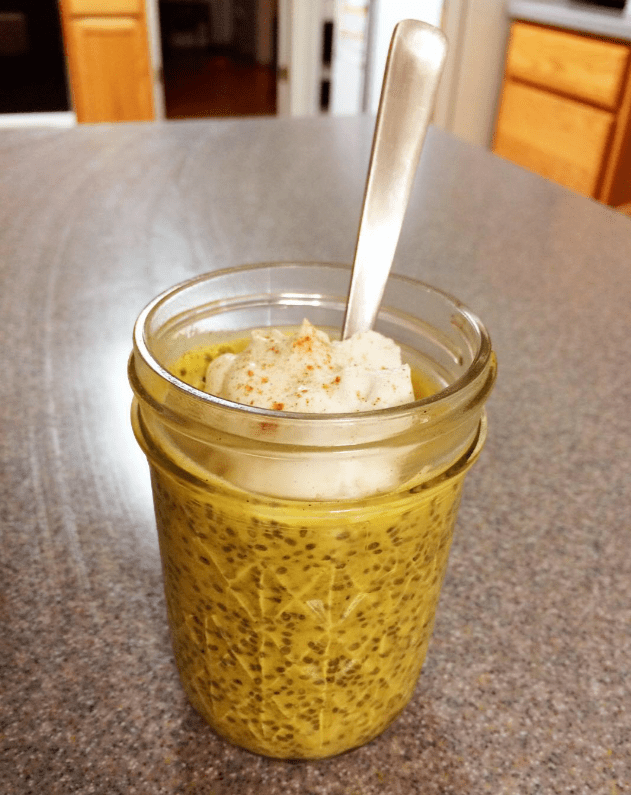 Or how about making a chia seed pudding? I made one by simply mixing a couple of tablespoons of chia seeds into the creamer and letting the seeds do their thickening magic for about 20 minutes before topping with whipped coconut cream and some cinnamon. I’ve played around with making almond milk, but just recently started branching out. 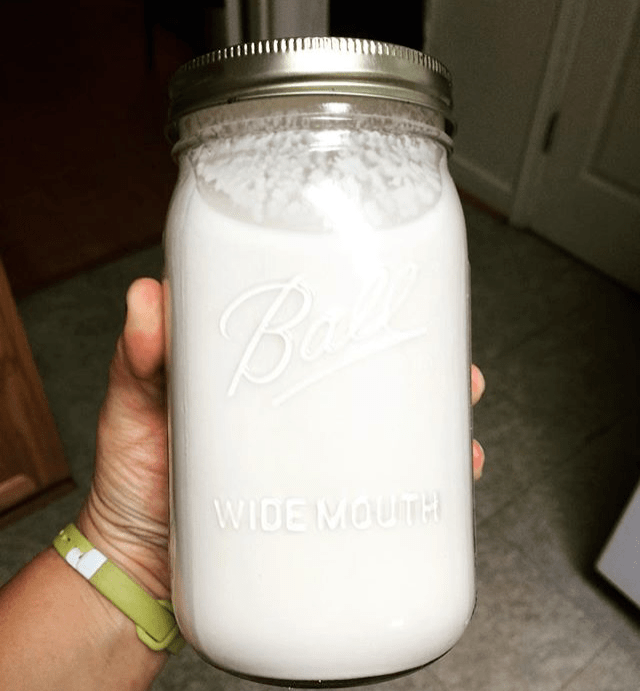 A couple of days ago I made hazelnut milk and it is crazy good! I especially love it in my coffee. It has the richness of cream and the flavors of fall. There are many different methods to making your own nut milk. Just do a Google search and you could come up with endless amounts of recipes. Here is the method I followed. 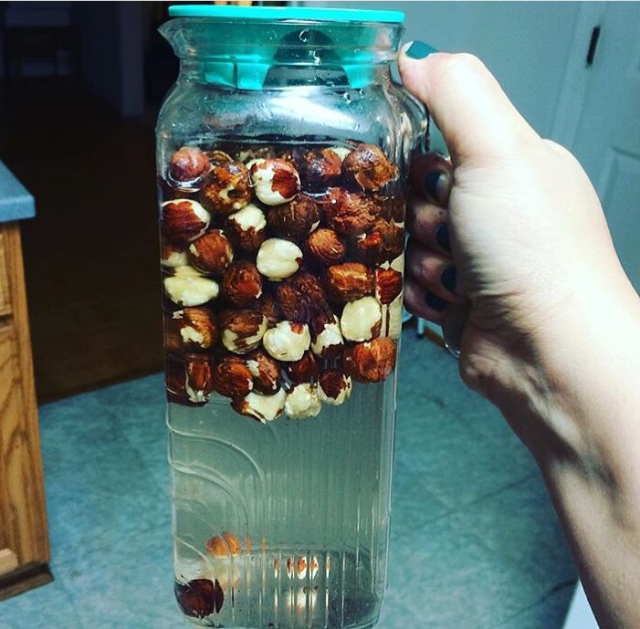 Soak the hazelnuts in 3 cups of water for 12 hours. Drain the nuts and rinse well. Place the nuts into the blender with 2 cups cold water. Pulverize the contents well. Strain the nut milk using the nut milk bag. Squeeze well to get out as much liquid as possible. Add a pinch of salt to the milk and stir well. Store the hazelnut milk in the fridge for 2-3 days. The milk will settle and may separate, just give it a mix before serving. Also, you can follow this basic recipe using other nuts such as almonds or cashews. I also made a paleo pumpkin spice coffee creamer that you can use your newly made hazelnut milk to make. Check it out here! It’s getting warm here in Virginia. Because of this I’m staying away from the oven. I like the idea of using my grill anyways. I came up with these delicious sliders because I wanted something with olives in it. 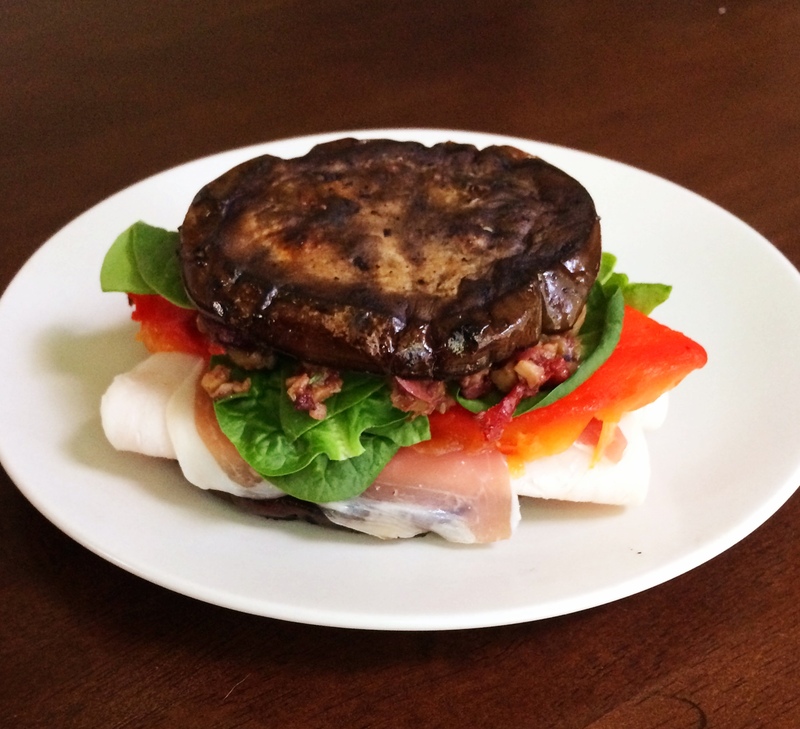 Of course, traditional muffulettas are filled with non-paleo/Whole 30 ingredients. This version is safe for all- unless you can’t handle nightshades! Because I am doing whole 30- I’m being more careful about what I add into my meals and there aren’t any compliant salami or ham options out there as far as I can tell. I used Applegate roasted turkey breast (the one from the deli counter at Whole Foods) and compliant prosciutto as a base for the meat. But if you are just going paleo then maybe you can find some ham or salami to add here. The choice is yours. I included the directions to make your own roasted red peppers. You can make these a day or two ahead of time. lunch meat of choice-ham salami, prosciutto, turkey, etc. 2. Grill them over medium high heat for 10-15 minutes turning occasionally until skins are blackened and peppers are softer. 3. Wrap the peppers in aluminum foil and let cool until you can handle them. 4. Peel peppers by rubbing away the blackened skin with your hands and remove the stem and seeds. Cut each pepper into 4-5 strips. 1. Slice the eggplant into 1/2 inch rounds. 2. Sprinkle the slices with some kosher salt and place in a colander in the sink or over a bowl to drain for 15 minutes. 3. Rinse the slices of eggplant well then pat them dry. 4. Drizzle or brush each side of the eggplant with olive oil. 5. Grill slices over low heat until browned and cooked thoroughly. 1. Place all the ingredients in a food processor or blender and pulse until you get a chunky spread. If you want a smoother paste just keep pulsing until you get the consistency you want. 1. Place one slice of eggplant at the bottom then add meat, roasted red peppers, spinach leaves, tapenade and another slice of grilled eggplant. I think these taste great warm, room temperature, or even cold. *Want to make it vegetarian? Make some additional grilled veggies to replace the meat. I like grilled portabella mushrooms and zucchini. Now that the weather is heating up I really only want to have cold drinks. 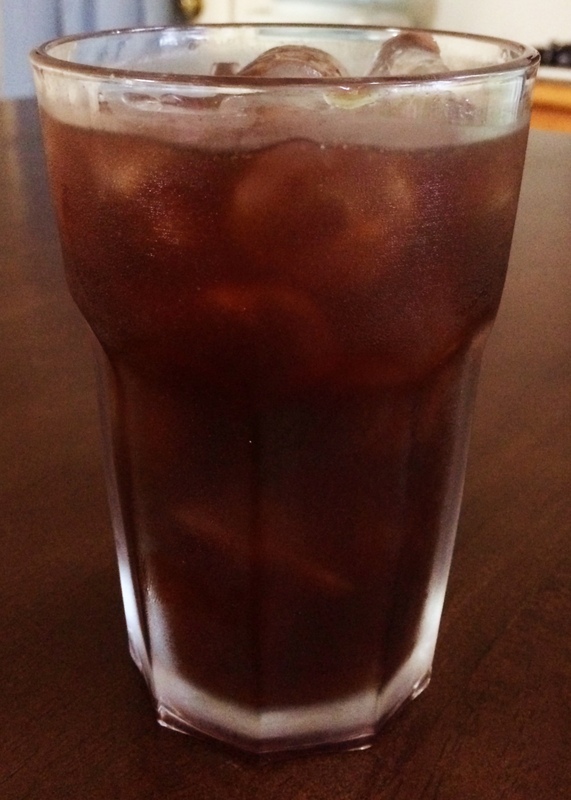 For me, a great cup of iced coffee with some coconut cream really hits the spot each morning. 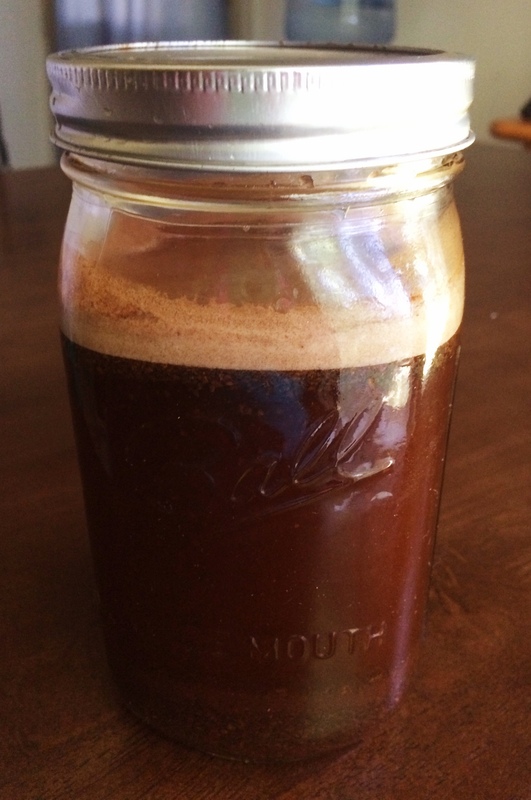 I usually only do one smaller cup per day so I make only enough cold brew coffee concentrate to last 3 days at a time then I remake it every few days. 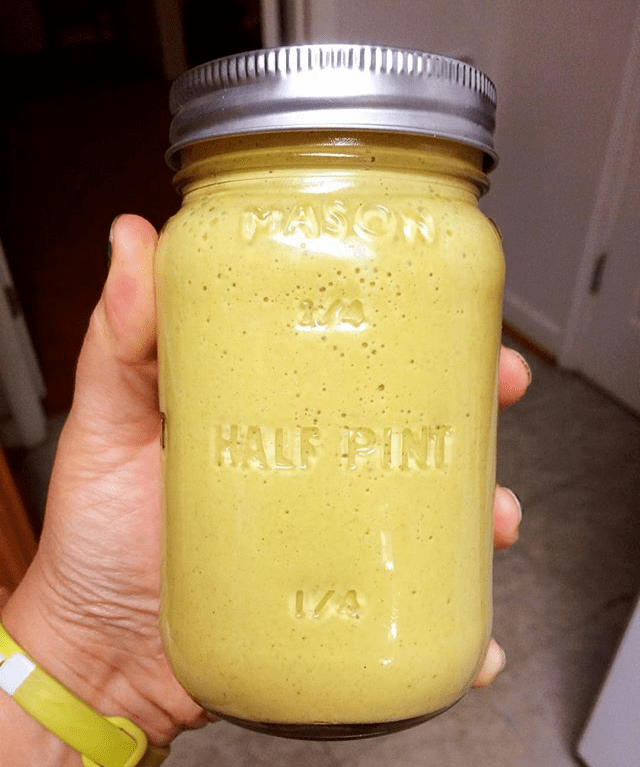 If you are used to drinking more than one cup per day or you have multiple people drinking it then you could easily double or triple this recipe. 2. Add the water and wet the grounds thoroughly and use a spoon to mix well, making sure that all the grounds are adequately wet. 3. Place the lid on the jar and let sit at room temperature for 12-15 hours. 4. Using the mesh strainer, strain out the coffee grounds, reserving the liquid. 5. Place coffee concentrate in the fridge until ready to drink. The concentrate will last covered in the fridge for approximately 5 days.To make each cup, add one part of coffee concentrate to one part coconut cream, coconut milk, or water and serve over ice. Sometimes I add a Tablespoon of unsweetened cocoa powder with the coffee grounds before adding the water so I get a mocha flavored coffee. 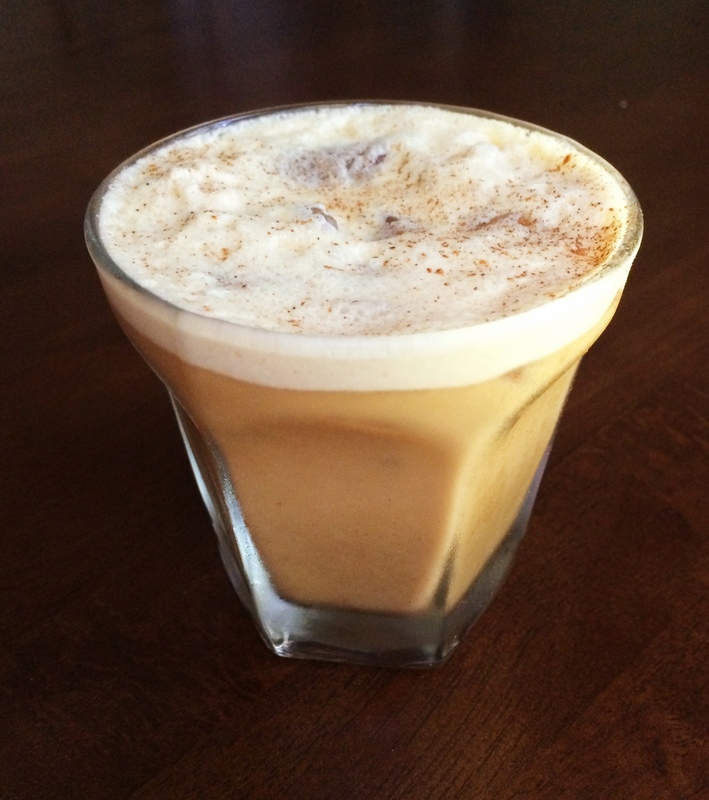 Each morning, I simply shake my coffee with equal parts coconut cream in a jar and add some ice and a dash of cinnamon. Shaking it in the jar leaves you with a frothy, caffeinated beverage. Here is what my morning glass usually looks like. 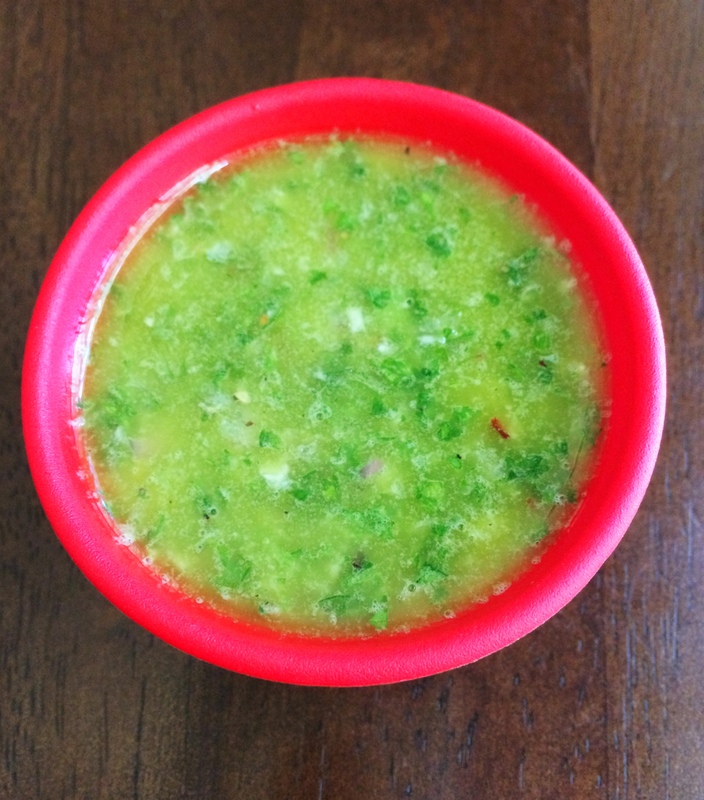 Chimichurri is an amazing fresh green sauce that is delicious slathered on grilled meats and fish. I have seen it served with steak most often but it is incredible on veggie kebabs, talipa, or burgers. It’s a great condiment to have on hand for your next barbecue. 1. Place all the ingredients in a blender or food processor. 2. Pulse until the sauce is well chopped but not pureed. 1. Add above ingredients all together and mix well. 3. Grill over a heated grill for a few minutes on each side until it reaches the desired doneness. 4. Brush each side of the eggplant with olive oil. 5. Grill slices over low until browned and cooked thoroughly. 1. Clean the portabella caps by using a damp vegetable scrub brush and brushing the top of each. 2. Cut off the stem and use a spoon to scoop out the black gills. 3. Brush each mushroom cap with olive oil and season them with salt and pepper. 4. Grill over low heat until browned and cooked thoroughly. 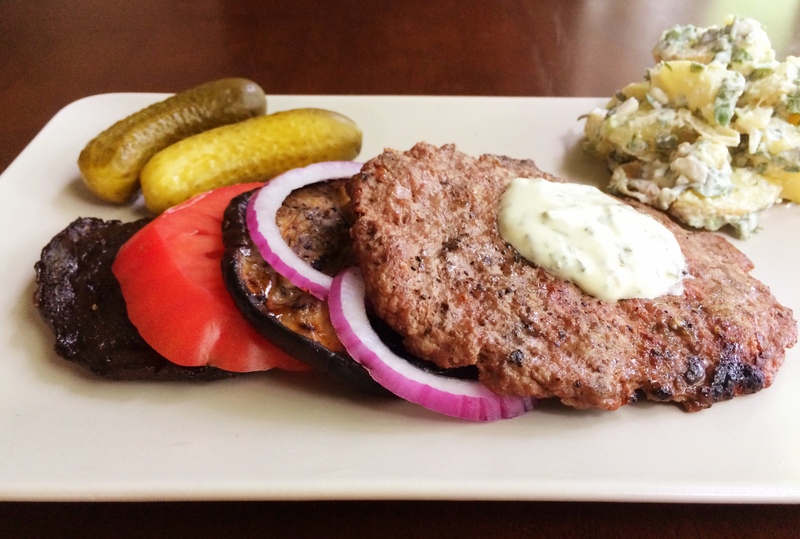 To serve stack the burgers together with the mushrooms, eggplant, and other desired toppings such as tomato, onion, mayonnaise, pickles, etc & desired side dishes. I like to serve my burgers with Herbed Potato Salad. 1. Begin by scrubbing the potatoes. Place them in a large pot and fill with enough water to just cover. Add a sprinkle of salt and heat over medium-high heat. You want to leave the skins in tact. Let the pan simmer, covered for about 20-25 minutes. You will know that the potatoes are done when you can pierce the flesh of the potatoes with a knife with minimal resistance. 2. Gently, pour the potatoes in the colander in the sink, and lightly rinse them with cold water. Let the potatoes cool completely. 3. Once cooled, cut the potatoes into desired sized pieces. 4. In a large bowl toss the potatoes, mayonnaise and herbs together and season with a little salt and pepper to taste. 5. Cover and chill the salad in the refrigerator for about 30 minutes before serving. 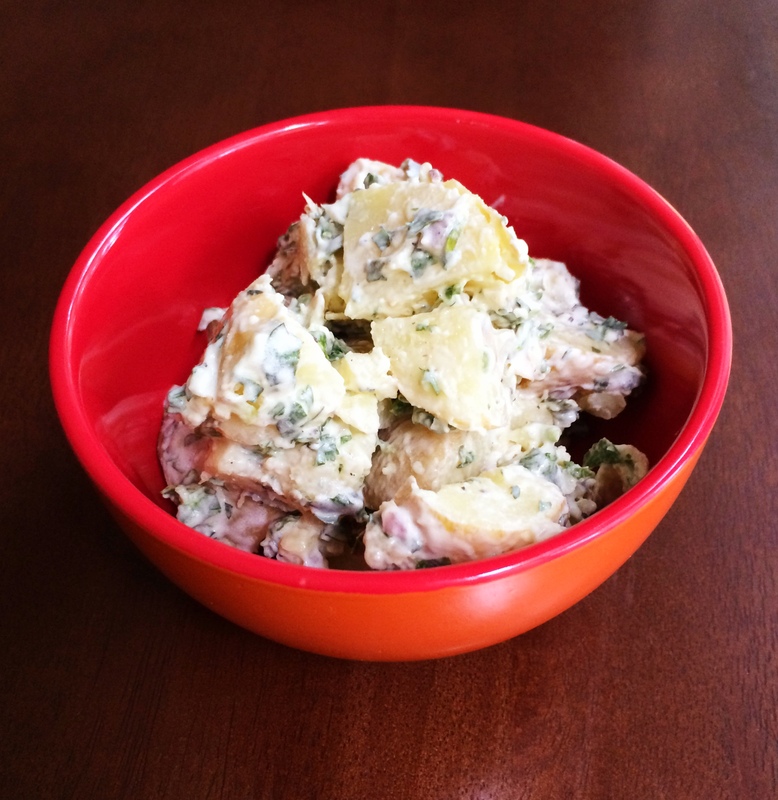 I serve my potato salad as a side dish to barbecued meats, burgers, or any type of picnic foods. 1. Start by removing the stalks and fronds (the leafy bits on the top) off the bulb of the fennel. Set aside some of the fronds for garnish. 2. Julienne both the fennel and red onion and set in bowl. Bon appétit has a great tutorial here if you need help with figuring out how to slice up the fennel. 3. 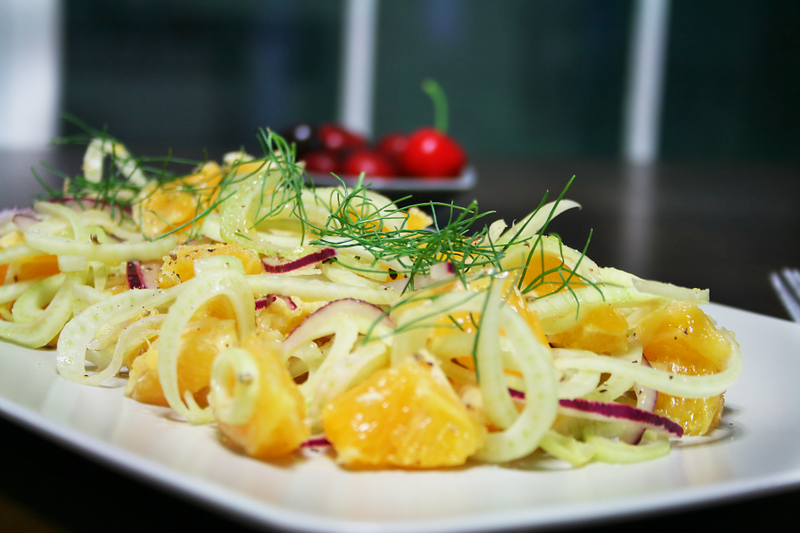 Remove the peel of the oranges and slice into small chunks and add to the fennel and onion. 4. Combine the oil, red wine vinegar, lemon juice, Dijon mustard, salt and pepper in a small bowl and whisk together. Add the dressing to the other ingredients and toss to combine. 5. Garnish with some of the reserved fronds. Eat this salad as a side to grilled fish or chicken. Or eat it as a meal by itself atop a pile of arugula or baby spinach. 1. Heat wok or a large skillet over medium-high heat and melt the coconut oil. 2. Once heated, add in the red pepper, carrot, sugar snap peas, onion, Thai chilies, garlic, and ginger and stir-fry for 2-3 minutes. 3. Add in the riced cauliflower and stir-fry for 2 additional minutes. 4. Add in the pineapple, coconut aminos, fish sauce, Thai basil leaves, green onion and cashews and stir well. 5. Remove from the pan and drizzle with a little sesame oil. This dish is great served on it’s own or as a side to Chicken Thighs with Pineapple Teriyaki Sauce. Whole 30 compliant, commercially prepared sauces are sometimes difficult to find. I like a fair amount of sauces for my food so I often just make my own. I came up with some delicious teriyaki sauce to go on some chicken thighs. 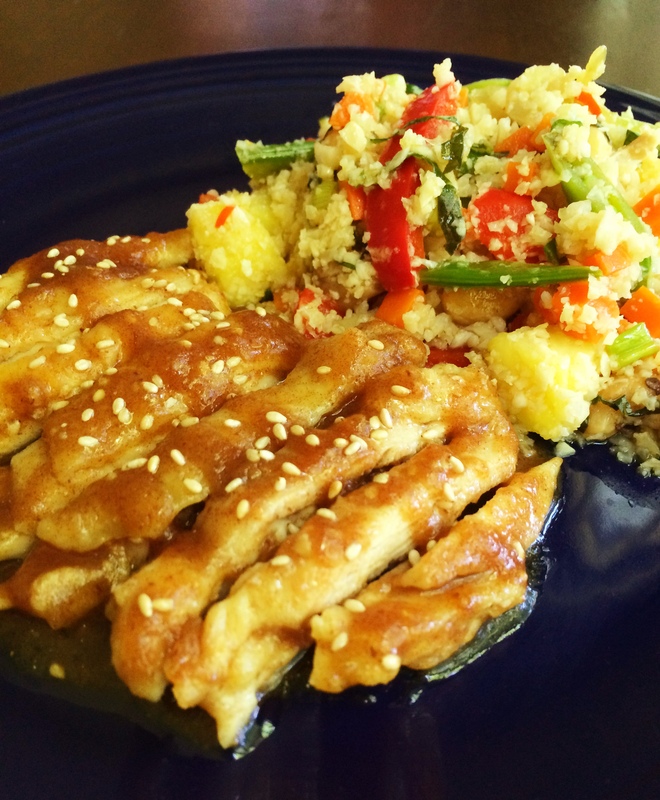 I love this chicken teriyaki served with Thai Pineapple Fried Cauliflower Rice. 1. Melt the ghee in a small pan over medium-high heat. Cook the sweet onion for 2-3 minutes until translucent and softened but not browned. 2. Add all the ingredients, including the onion, to a blender and blend well into a smooth sauce. 3. Place blended sauce in a small sauce pan over medium heat to simmer for 10-15 minutes to thicken. 1. Start by removing the bones from the chicken thighs. Start at one end, and begin to cut out the bone being careful that you do not cut through the meat. Stay as close to the bone as possible to reserve the most meat on the thighs. 2. Season the thighs with salt and pepper. 3. Heat the skillet over medium-high heat and add in the ghee. 4. Cook the thighs for approximately 4-5 minutes per side until browned and cooked through or until a meat thermometer reaches 165 degrees F.
5. Add in a few scoops of the teryaki sauce to coat the sauce and thicken a bit more. 6. Slice the chicken into strips, add a little sauce from the pan to the chicken and sprinkle with a few sesame seeds. 7. 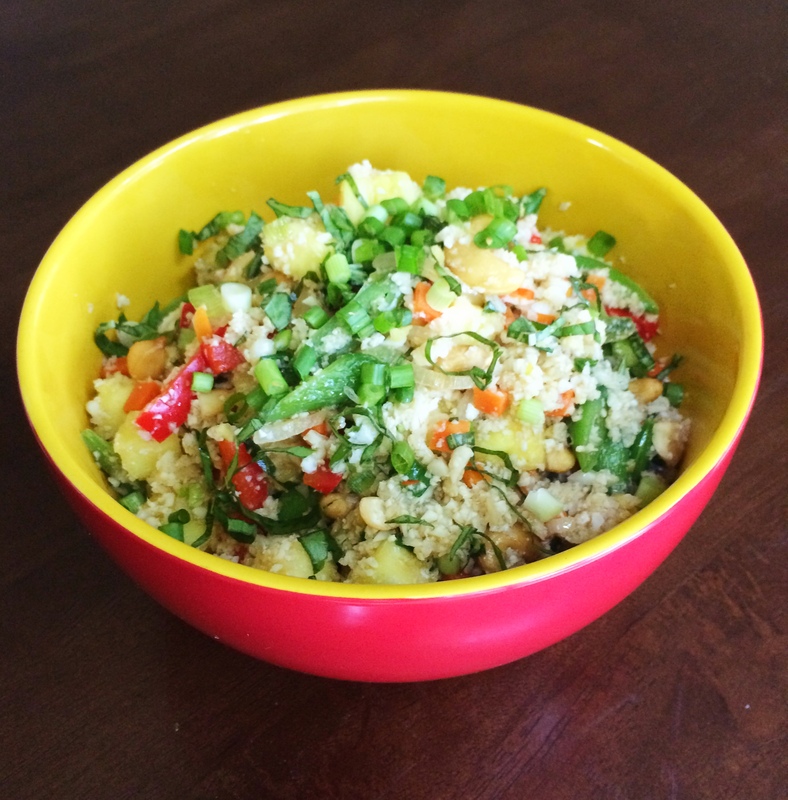 Serve with Thai Pineapple Fried Cauliflower Rice.